Clean water, also known as “potable,” flows under pressure through municipal water lines to Kennewick homes and businesses. However, this doesn’t always work the way it was intended to, resulting in “backflow.” Backflow is the reverse flow of dirty water through the clean water lines. Dirty water can be contaminated with feces, pesticides, chemicals, fertilizer and other hazardous materials, and causes a serious health hazard. If you suspect this is happening at your home or business, call Coffey Refrigeration today. Our skilled and certified backflow technicians are experienced in testing servicing for all types of backflow prevention devices. For testing and repairing steam pipes, boilers, and irrigation systems, you need Coffey Refrigeration. If a test shows you do indeed have a problem, your repair needs to be completed immediately. 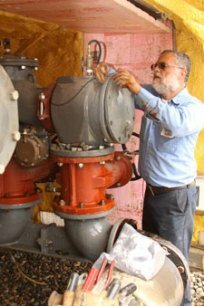 Our experts can perform annual backflow testing, repairs, installation and backflow certifications to stay inline with the law. We offer the best prices and the best service on every single job, that’s why so many in the Kennewick, Richland and Pasco areas trust us. If your Tri-Cities home or business needs backflow repair services, call us right away. No matter how big or small your repair job is, you can always expect the same quality on the work we do. Give us a call at (509) 586-1519 to request our services. You can also email us at coffey11@ymail.com to set up a non-emergency repair.